Skip this post if you were expecting something other than a Nashville bike infrastructure update. Over the weekend, I took some photos of a couple of Nashville bike- and walk-friendly projects that have been planned for years but are now “for-real.” If you’re not interested in Nashville bicycle infrastructure, don’t feel lonely. One of this blog’s 12 readers is bound to find Nashville’s bike and walking infrastructure a riveting topic. This set of photos (embedded from my Flickr account where each photo is annotated) are of the first phase of a stretch of greenway that runs adjacent to Nashville’s “inner-loop,” I-440. Even life-long Nashvillians would be challenged to know where the photos of the underpass are located, so I’ve embedded a Google Map below the photos. This section goes from Murphy Road to Centennial Park. 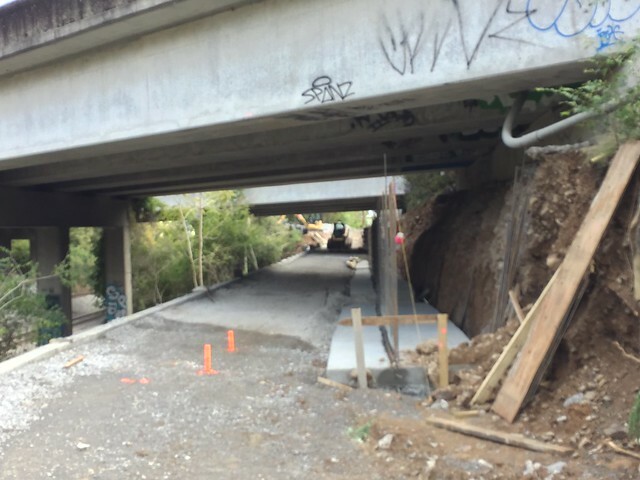 The “magic” part of this greenway that few people with find hard to believe is the under-pass that goes under 440 rather than over it (like the current Acklen Park Ave. Bridge). When the greenway is completed, it will become a popular, safe and family-friendly bike/walk route to Centennial Park and the Vanderbilt area from neighborhoods west and north of this greenway (especially after the graffiti is removed). One the map, the bike icon is the location of the underpass. I added a photo of Froogal McDoogals (a liquor store that anchors one end of the bridge) so that Nashvillians could quickly vector in on the location. 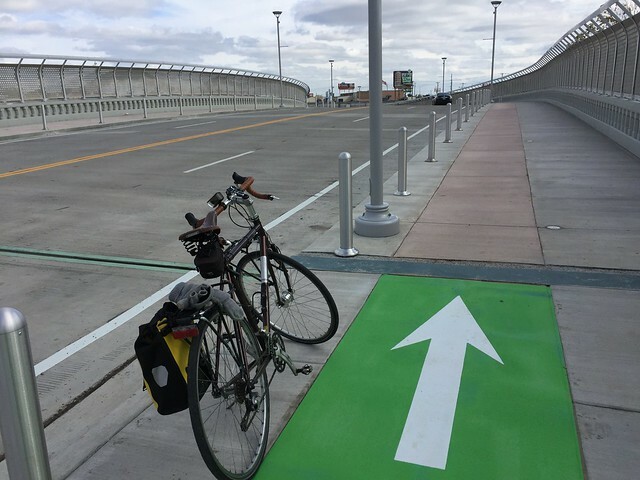 For urban transportation wonks, the design of the bridge is called a Complete Street or “multimodal.” This simply means that the street was conceived as a passage not only for people driving cars but also with designated and protected lanes for people on bicycles and people walking. And when I say, “protected,” I don’t mean the white plastic separators going up around town (which I’m all for), but I’m referring to the metal kind you can see in the photos. The bridge and the approaches on each end are designed to connect “the Gultch” to Second Avenue, nearby the Music City Center. I wish it were always true; that “the Nashville way” is all about spreading love. I’ve seen lot’s of examples of Nashvillians spreading love. But I’ve examples of the opposite, also. I wish spreading love was everyone’s way. But we all fall short. But I still think I’ll get one of the shirts to remind me to keep trying. Now I know the ingredients of a tear jerking country song. I’ve lived in Nashville for almost 40 years, but I’ve learned more about country music in the past 40 minutes than I had in all those years. The current episode of Malcolm Gladwell’s podcast, Revisionist History, is titled “King of Tears.” It centers on a talk Gladwell had in Nashville recently with legendary songwriter Bobby Braddock, now in his 70s. (Minor spoiler: He’s the person being referenced to in the title of the episode. You may not know who Braddock is, but you’ll be tracking down all of the songs he wrote by the time the podcast episode ends. I finally have an answer to those questions. I wrote this for Hammock Inc.’s Idea Email. Because an Idea Email is sent every other week to subscribers across the United States and globally, we try to keep our references universal, not local. But when something big happens a few blocks from the Nashville office we call Hammock HQ, we can’t help wanting to share. And no, I’m not talking about the unprecedented way in which locals (including us) have gone nuts over the success of the Nashville Predators and their first appearance in the finals of the NHL Stanley Cup Playoff (#GoPreds). I’m talking about the Nashville Public Library being named Library of the Year by the trade publication Library Journal. You can read all the reasons why here in the magazine’s cover story. Because the word library is associated with the physical book (or codex), many have mistakenly placed libraries on the endangered species list. But in addition to the resources and programs great public and academic libraries have embraced in the digital age, these libraries also serve as role models for making content—the core value a company provides its customers—organized and accessible. The professionals who run libraries are experts in gathering and organizing information critical to workers and customers (or any audience served). They are trained in creating ever-changing taxonomies of knowledge. They’re on the frontlines of finding new ways information can be there when you need it—not just when a writer clicks submit. As we move into an era of more complex digital media, the skills of trained librarians (and the many other titles they go by) will increasingly become a model for capturing, organizing and making accessible the knowledge that gives your organization a unique and unbeatable competitive advantage. Bookmark this on your iPhone so you’ll be a tap away from complaining at all times. I used to complain about stuff in my head. Then someone on the Nashville Walking & Biking Email Group sent this list out and I tried calling someone up and telling them about the issue. Amazingly, it worked. P.S. Here’s the link to that email group. I’m one of the people who manages it, so contact me if you feel the need to complain about the list. Call these people to complain about everything else. If you have questions or concerns about transit connections, placement of bus stops, or issues around accessibility.